I arrived at the YouTube Space in London at 9:30am and was one of the first people there. Before long, people started to turn up, some of which I recognized from previous shows and LPU events! Whilst waiting outside I met LP Association admins Joe and Ree; it was really cool to meet people from another fan site. Once it was time to go in and register, around 30 people had turned up. I expected more from what I had seen online at the event in Amsterdam, so was super excited seeing that this was looking to be smaller. Once Mike and Chester came in, they played acoustic versions of Heavy and Burn It Down, like they have at the other events. Swedish singer Sofia Karlberg sang Kiiara’s part and she was great! You can check out the performances in the video below. After Burn It Down Chester mentioned to me that I look like Kurt Cobain, which was hilarious. They then they came down to chat and take photos with everyone. Next, when they had sat down, YouTuber David Brown (@boyinaband) then came in to interview Mike and Chester. They discussed a lot; from the new album to different YouTubers, all the way to the culture of memes surrounding the band. There were many cameras filming them at the event, so I’m sure they’ll be releasing the full conversation soon! Once they were done chatting Chester and Mike came down and spoke to everyone for one final time before they had to leave. During the interview Chester told us some lyrics from the song Halfway Right; ‘I scream at myself, when there’s nobody else to fight. I don’t win, I don’t lose, if I’m wrong, then I’m halfway right’. 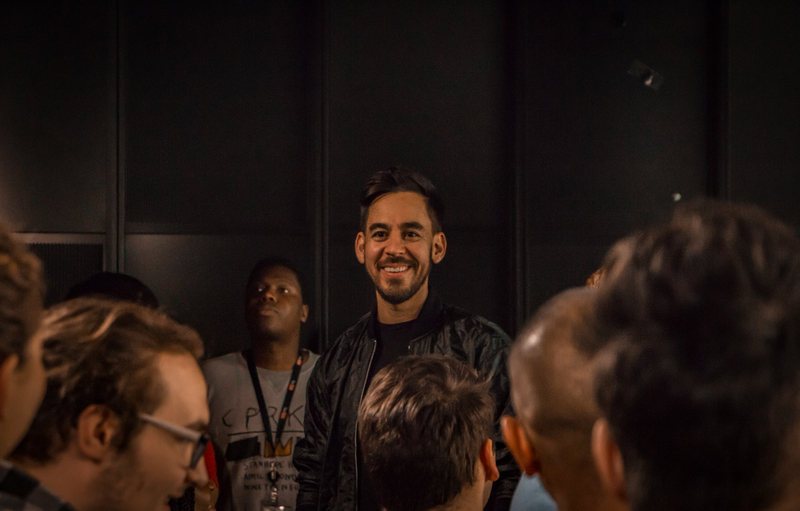 Before they left, I spoke to Mike about Good Goodbye, the second track on One More Light featuring Stormzy and Pusha T. He mentioned that it’s the most hip-hop track on the album and has a sense of humor to it. As well as it being fun, he also said it’s a bit of an outlier on the album and stands out a lot from the rest of the songs. The event lasted around an hour and a half and was a fantastic experience. It’s great watching them playing these intimate events online, but actually being there and seeing them in person is incredibly different. If anyone gets a chance to attend a Linkin Park event like this in the future, I couldn’t recommend going enough! I also made a short video of the event – check it out below! This entry was posted in 2017, Blog, Events, Fan Reviews, Live, LPFC Reviews, Media, News, Pictures, Promotion, Videos and tag linkin park.